HAVING concluded the last-mentioned prayer, the priest rubs the thumb and index finger of each hand over the corporal, in order to free them from any dust or defilement that may have adhered to them up to this time, and all this out of respect for the Sacred Host which he is going to handle at the moment of Consecration. Taking up the Host, he says: “Who the day before he suffered took bread into his holy and venerable hands, and with eyes uplifted to heaven to thee, O God! his Father Almighty, giving thanks to thee, he blessed, broke, and gave to his disciples, saying: ‘Take and eat ye all of this: FOR THIS IS MY BODY.’ ” The consecration of the bread is now effected, and, to adore our Lord present on the altar, the priest makes a profound genuflection the moment he has pronounced the sacred words. After this he raises the Host on high for the adoration of the people, and, having then placed it on the corporal before him, goes on to the consecration of the chalice. He first takes off the pall which had been covering the mouth of the chalice since the Offertory, and rests it against the altar-card in front of him. Then, taking the chalice, he continues thus: “In like manner after he had supped, taking this goodly chalice into his holy and venerable hands, also giving thanks to thee, he blessed and gave to his disciples, saying: ‘TAKE AND DRINK YE ALL OF THIS, FOR THIS IS THE CHALICE OF MY BLOOD OF THE NEW AND ETERNAL TESTAMENT; THE MYSTERY OF FAITH, WHICH SHALL BE SHED FOR YOU AND FOR MANY UNTO THE REMISSION OF SINS.’ ” This is the form by which the consecration of the chalice is effected, after which the priest kneels down in adoration as before, and recites while he is doing so the words, “As often as you do these things you shall do them in remembrance of me.” He then elevates the chalice as he did the Host, and after the last genuflection covers it again with the pall. With the exception of a few words, both forms of consecration are taken from Holy Scripture. What is added over and above we shall now point out and explain according to the most approved authorities. We preface our remarks by reminding the reader that the essential form of the consecration of the bread is, THIS IS MY BODY, and of the wine, THIS IS THE CHALICE OF MY BLOOD, or, simply, This is my Blood. The rest, however, must be said under pain of mortal sin. These words are not Scripture, but were added very early by some of the popes. Walfridus and Micrologus ascribe them to Pope Alexander, who ruled the Church from A.D. 121 to 132; but Cardinal Bona and others are in favor of attributing them to some one of the apostles. They are to be found in the Liturgies of SS. James and Clement. This was what we now call Maundy Thursday, which, according to the best authorities, fell at the period of our Lord’s Passion on the 22d of March (Romsee, iv. p. 207). The words “took bread” are given by the Evangelists, but the remaining ones are not. They are, however, of very high antiquity, and are found also in the liturgies of the East. These words are not found in Scripture, but it has been a constant tradition that whenever our Lord was about to per-form any solemn act he always looked up to heaven. St. Matthew (14:19) records that he did so when he performed the miracle of the multiplication of the loaves; and St. John records the same of him at the resuscitation of Lazarus (11:41). The particle enim, “for,” in both forms of consecration, is also a subsequent insertion. St. Thomas Aquinas says (Quæst. 78, 3) that it was added by St. Peter. In the language which our Lord spoke at the Last Supper and during his life upon earth—viz., the Syriac—the consecration of both species was effected by uttering two words each time; the form of the consecration of the bread being ܢܘܦܓܪܝ—honau pagri, and of the wine, ܗܢܘ ܕܡܝ—honau demi. Whereupon it is worth remembering that the verb “is” does not stand separate by itself, but is incorporated, in each case, with the demonstrative pronoun “this,” thus leaving no room for doubt as to what our Divine Lord meant when he pronounced the sacred formula. Touching the word “benedixit” employed upon this occasion, and in virtue of which both bread and wine are blessed by the priest, some curious opinions have been advanced. Ambrosius Catharinus, the great Dominican theologian who proposed so many intricate questions at the Council of Trent, held that the moment our Lord pronounced the blessing over each element at the Last Supper consecration took place, and that the words, “This is my Body,” etc., were merely added to point out the change which had been effected. Catharinus, it seems, preferred to take this view of the matter, in order not to make it appear that consecration did not take place until the disciples had the bread and wine in their own hands, which would certainly involve an incongruity. St. Augustine, who evidently foresaw the same difficulty, advanced the opinion that the order of the words may have been different from that given by the Evangelists, and that probably they were as follows: “He blessed, saying, ‘This is my Body’; then he broke and gave to his disciples.” According to this, consecration took place the moment “This is my Body” was pronounced. St. Thomas Aquinas, the great Doctor of the Blessed Eucharist, follows the same line of thought as St. Augustine, and gives the order of words as follows: “Taking bread into his hands, he blessed it, saying, ‘This is my Body’ ”; so that, according to the Angelic Doctor, the blessing uttered on this occasion was also the formula of consecration. There is yet another view. According to Fromondus and others, it cannot be presumed that in a matter of such grave moment the Evangelists would omit the slightest particular, and that inasmuch as all of them agree in narrating the order of the words on this occasion, it is not lawful to change this order from the way in which the Gospels give it; and that, therefore, we must read as follows: “He blessed” by invoking the name of his Father upon the bread in order that it should become his Body; “he broke” into as many parts as there were persons to communicate; and, thirdly, “he gave to his disciples”—that is, into their hands—saying, “Take ye and eat; this is my Body.” Whether the order of words was different or not, at the Last Supper, from that given by the Evangelists makes but little matter to us, since it is the teaching of the Church that the essential form of consecration is, “This is my Body,” and of the chalice, “This is my Blood” or “This is the chalice of my Blood,” which amounts to the same thing (see Romsee, iv. p. 209). As far as relates to the other question sometimes asked—viz., whether our Lord made the sign of the cross or not when he blessed, as we do—it is hardly necessary to delay, for whether he did or not matters little. Most probably he did not make this sign upon that occasion, for as yet the cross had not obtained its efficacy. It is generally held that our Lord on this occasion made thirteen divisions of the Holy Eucharist, and that he himself communicated, and permitted the traitor Judas to communicate with the rest. The Fathers of the Eastern Church, as well as those of the Western, have always held this. It is also surmised that our Lord must have broken the Sacred Host at this time with peculiar and impressive ceremonies; for it is narrated of the disciples who supped with him at Emmaus that their eyes were opened, and that they knew him in the breaking of bread. 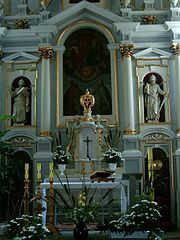 The Ambrosians, or Milanese, immediately before the “qui pridie”—that is, a moment or two before they pronounce the sacred words of institution—go to the Epistle side of the altar and wash their hands, out of respect for the Host which they are soon going to handle. This is the only rite in the Church where such a custom prevails. We should have said before, perhaps, that immediately after the priest has placed the Sacred Host on the corporal after the elevation, he joins the thumb and index finger of both hands, and never separates them from that time until Communion is over, unless when touching the Sacred Host. This is done out of respect for the Blessed Sacrament, as well as to avoid the danger of losing any minute particles that may have adhered to these fingers.